Every baseball player knows that a trip to the big show starts with practice, and the SERIES TRAINING PULLOVER will outfit you for a win. Part of our Series Collection, this half-zip jacket is made of 100% micro polyester with polyester closed hole mesh inserts. Constructed in a half-zip pullover style, raglan sleeves give way to contrasting color inserts on the front and back. 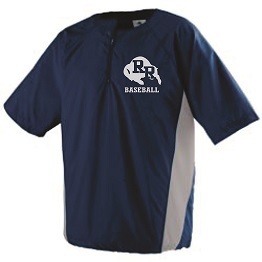 This open bottom short sleeve baseball pullover, dropped tail polyester jacket is water-resistant and machine-washable, but don’t let the baseball moniker fool you - this is an affordable half-zip pullover for any purpose.